Joe Bonamassa releases his latest live album on 23rd June. While most artists rarely release live albums and have long gaps between them, Joe Bonamassa takes a different approach, releasing live albums on a regular basis. The reason that works for him is that he always makes sure that they offer something different, so you're not just getting a standard show with a slightly different setlist, there's always more to it. He's released albums such as "Muddy Wolf at Red Rocks" where the set was all about paying tribute to two blues legends and "Live at the Greek theatre" where he paid tribute to the three kings - BB King, Albert King and Freddie King. He's also done an acoustic one - "An Acoustic Evening at the Vienna Opera House" The one thing most of his live albums have in common is that he likes to record them at iconic venues - Red Rock amphitheatre, Greek theatre, Vienna opera house, Royal Albert Hall, Radio city music hall, and now Carnegie Hall. 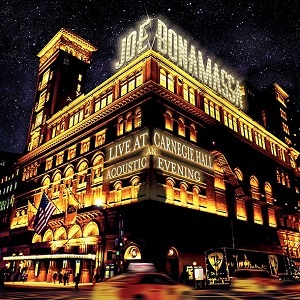 So, since Joe Bonamassa has done an acoustic live album already, what makes this one different? Well for a start this time it's a much bigger band - a 9 piece acoustic band . He's got three backing singers and guest musicians include world famous Chinese Cellist Tina Guo and Egyptian percussionist Hossam Ramzy. Alongside the musicians already mentioned, Reese Wynans on keyboards and Anton Fig on Drums - two musicians who regularly play with Joe Bonamassa, and also Eric Bazilian on Mandolin, hurdy-gurdy, saxophone and acoustic guitar. Throw in a setlist featuring re-arranged songs and some he hasnt released live before and there's plenty to separate the two acoustic live releases. The differences really shine through when you listen to the albums one after the other - there really is a big difference between them, far more in fact than I'd expected, and a large part of that has to be down to the different instruments used as well as the addition of the backing singers. It feels slightly redundant to say how good Bonamassa's guitar playing is - after all it's always consistently first class whether he's playing electric or acoustic, and he always knows which of his many guitars to use to get the perfect tone for a particular song. The backing singers really enhance all the songs where they're used, but it's Hummingbird where they truly shine, lifting it to a level that is simply superb. The show ends with "The Rose", and to be honest after the stunning version of "Hummingbird" I really didn't think anything could follow it and not feel like an anticlimax, but somehow Bonamassa manages to deliver a beautiful emotion packed version of "The Rose" that was a beautiful end to the show and album. Once again Joe Bonamassa has delivered a great live album that offers something new to his fans.